Soak tamarind in 1 cup water for 15mins, squeeze the thick pulp out and keep aside. Pressure cook toor dhal with 1.5 cups of water until mushy.Smash it well once and keep aside. In a pan, add oil temper mustard seeds, urad dhal once they crackle add fenugreek seeds, curry leaves and hing. Now add onion and tomato saute until raw smell of tomato leaves. Now add the veggie(pumpkin) saute it slightly. Now add the smashed dhal, add turmeric powder, sambar powder, required salt and mix well. Allow it to boil for 5mins then add tamarind pulp mix well. Allow this to boil for 10mins until the sambar starts thickening. Switch off and garnish with coriander leaves. Heat a pan with oil, add mustard seeds, urad dhal, jeera allow it to crackle. Now add green chillies and curry leaves, saute for a minute.Add onions saute for 3mins. 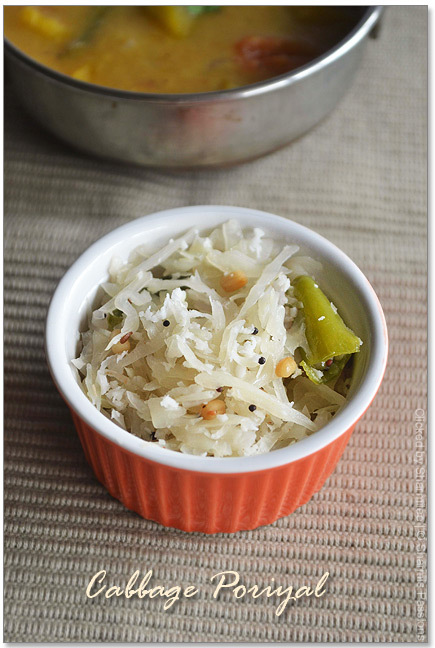 Then add grated cabbage, saute for 2mins. Sprinkle little water (do not add more water as cabbage will let our water by itself) and cook keeping lid closed until cabbage gets cooked and becomes soft.Add required salt. After few mins say 5-7mins the water would have evaporated completely and the cabbage would have turned soft and dry. Add coconut give a quick stir and switch off. 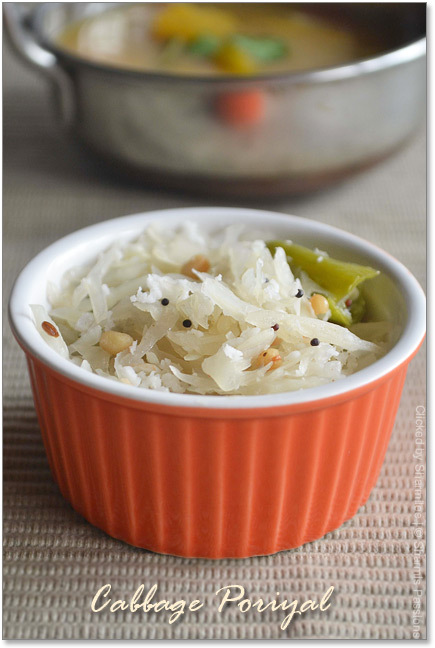 For cabbage poriyal, you can also add a tbsp of cooked moong dhal. I sometimes add channa dhal for tempering too. 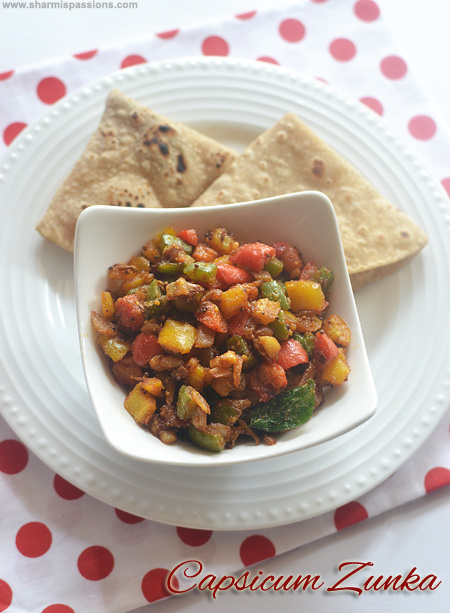 You can use any veggie for ur choice and proceed with the above recipe for sambar. Saute and cook the veggie accordingly. 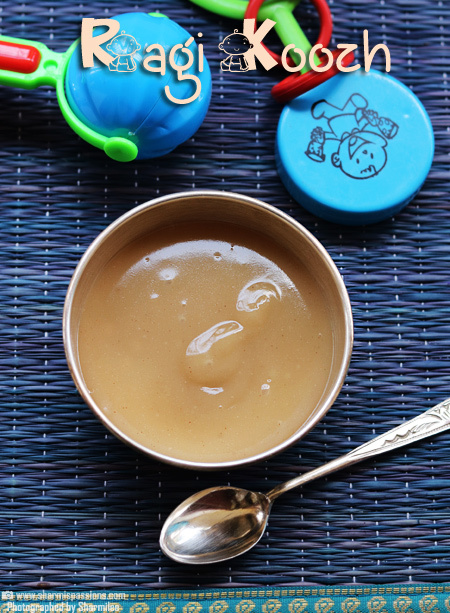 Drizzle ghee while mixing sambar with rice and enjoy a heartful meal. May be it is my browser i coudn't see the picture, i love cabbage,well made porial or Indian way, but hubby hates cabbage, so i never make them, we used to have it a lot in our lunch box. A small lemon sized ball of what? @Anonymous : Its lemon sized tamarind ball….. Perfect lunch menu!! !hv never added fenugreek seeds for tempering in sambhar let me try it out!!! 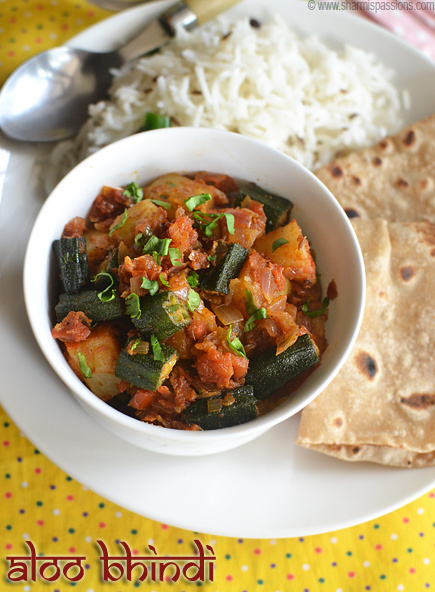 Love this addition of pumpkin in sambar and cabbage poriyal looks simple and delicious. Comforting and wonderful meal, lovely combo.. Comforting meal Sharmi. Love your kadai and the ramekins. Where did you buy the colored ones dear? Comfort food! Aha..Just feel like grabbing that plate. Superb presentation as always Sharmi! 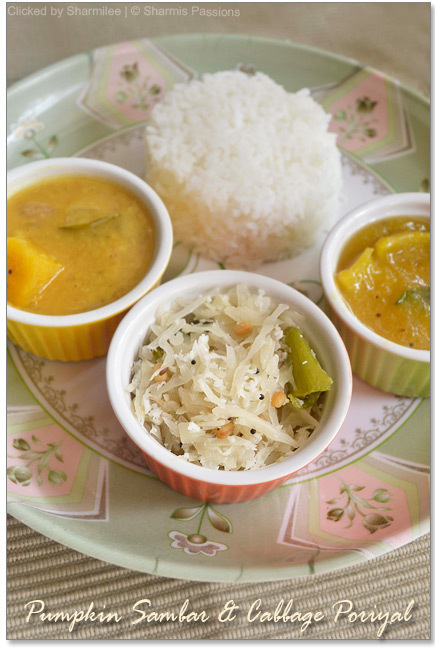 Luv the sambar and Cabbage poriyal pics..True,its the most comfort food.. Reminds me of home 🙂 Been days I made cabbage curry here. Love pumpkins in sambar! Excellent looking and comforting meal dear. Great clicks. Simple meal, looks very comforting. I do not like cabbage so I do not make them often. My husband and daughter like it though. Perfect meal and its really tempting..
the key words "diet plan" brought me to your wonderful space !! loved the layout as well as several recipes ! Do drop in at my place when time permits ! 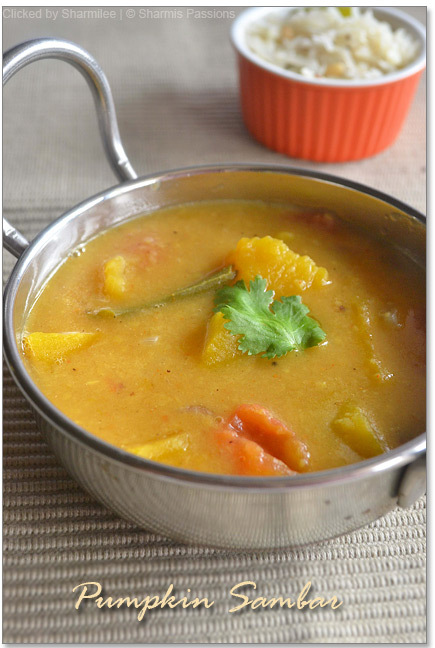 Pumpkin sambar and poriyal both looks delicious.. Delicious platter ~ love the clicks! Hi, Tats really awesome !!! Thank god bored of all restaurants as a bachelor. 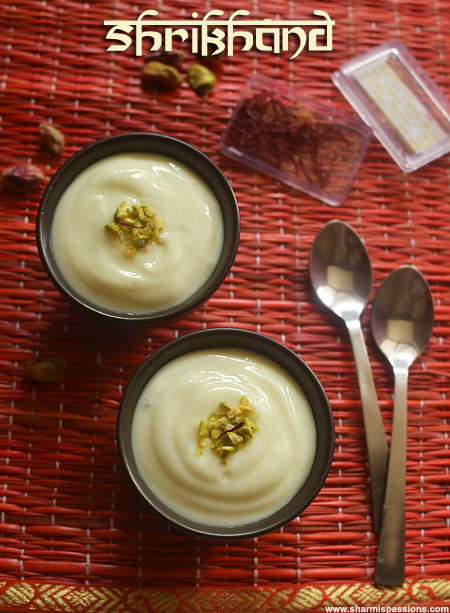 Its like heaven I have seen ur website… Pat on back ***** Keep going……..
@Kalyani : I used yellow pumpkin….you can use any veg of your choice. Hello for Israel and thank you for those grate recipes. There one thing I don't understand. 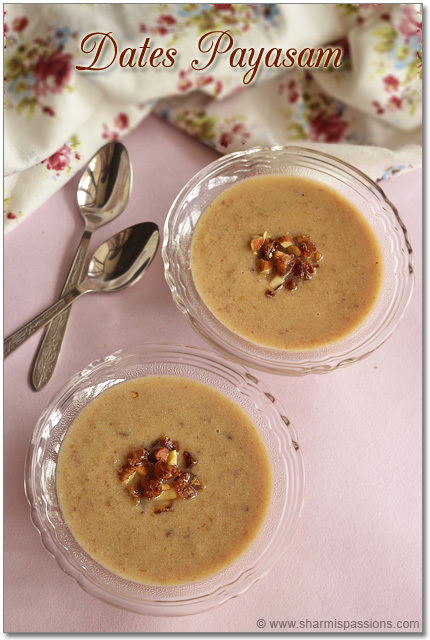 In the "to temper" part it is often mentioned to add urad dal to the sauce. 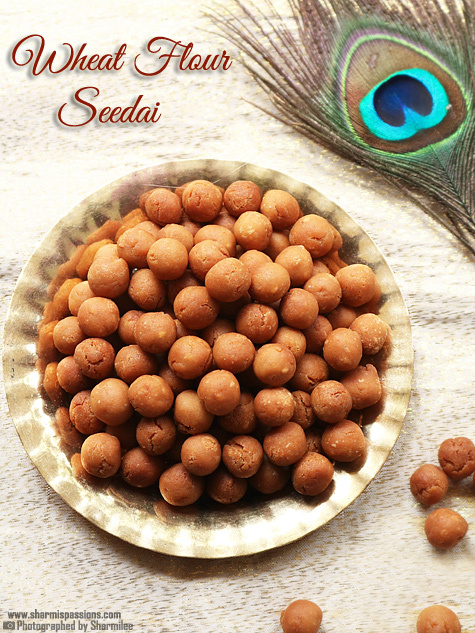 Is it a pre-cooked urad dal or roasted ? I just can't Imagine adding it as it is. @Makopolok: Hi! Yes we add urad dhal raw along with mustard seeds in preheated oil and allow it to splutter, in that way it gets almost fried. 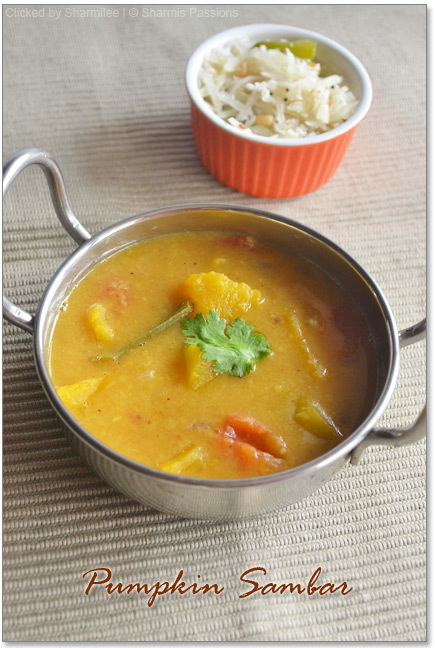 You can even use split urad dhal instead of whole which is even more better for tempering. Interesting it seems to me quite hard as an ingredient, but I'll try it . I dont do anything special…dont make it in iron kadai…dont let the onions also to brown which will give a brown shade to the poriyal…hope these tips help!